Are You Being Exploited By Price Comparison? - FairMoney™ in the Sunday Mirror! Are You Being Exploited By Price Comparison? - FairMoney™ discusses this in the Sunday Mirror! 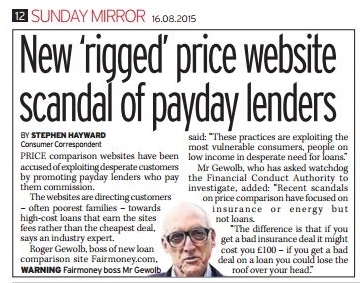 FairMoney™ proudly announces its coverage in the 16th August 2015 Sunday Mirror, commenting on issues customers can encounter when borrowing money through some loan price comparison websites. As a new fair and unbiased loan price comparison website, we are extremely conscious of those around us who may not be offering customers the most transparent and fair deals. Some well-known loan price comparison websites are prominently featuring lenders and loan products that reward them with higher paid commission. Rather than first place going to the loan product with the lowest/best rate, the company who pays the most commission buys themselves top position. Unbeknown to many customers some loan price comparison websites rank their tables based on profit to them and not by what loan product best suits/benefits the potential borrower. “These practices are exploiting the most vulnerable consumers, people on low income in desperate need for loans. “Recent scandals on price comparison have focused on insurance or energy but not loans. Losing your home may seem extreme, but for many people, by choosing the wrong loan product, this nightmare has become a reality. Choosing the wrong loan, lender or borrowing money that you simply cannot afford to pay back can result in some real money issues. We don’t want anyone to get into this situation, that’s why we’re campaigning for transparency within the loan and price comparison industry. For anyone looking for a loan, the smart move would be to compare all options prior to taking out any particular loan product. Comparing loans should be simple and easy to do, however many customers are being let down by the loan price comparison websites that they have grown to trust. That is why FairMoney™ was created, to offer our customers the most fairest, honest and transparent loan comparison available today. In addition, by using our Smart Search Technology, our loan tables will present customers with a loan comparison that best suits their own individual credit profile. And we can guarantee that our panel of lenders will be presented to our customers in order of cost to them, and ranked by APR, as at FairMoney™ the top loan product on any of our loan tables will be the cheapest loan option for our customers. Before taking out any loan customers must make sure that they understand exactly what each product is, and look to see what the other alternatives there are available to them. If a customer is in any doubt please refer to our easy to understand FairMoney™ product descriptions/guides. In addition, if you are looking for a loan please let FairMoney™ help you to find a deal that works for you and your needs, by comparing products from one of our listed responsible lenders.